Tribute 1 DARK monster with 3000 or less ATK; your opponent destroys 1 card in their hand and/or Deck for every 500 ATK the Tributed monster had on the field, also if you Tributed a monster with 2000 or more ATK, check all cards your opponent draws until the end of their 3rd turn after this card’s activation, and destroy all monsters among them. Cards destroyed and sent to the GY by this card’s effect cannot activate their effects during the turn they were destroyed. Grinning Grave Virus is a Normal Trap that really punishes decks. Realistically you’re only going to want to tribute a Dark Monster with 3000 Atk to get the full value of the effect, but you could do a less Atk monster as cost. Obviously, with Lair on the field you could an opponent’s boss monster which would be a lot of fun. After tributing, the opponent send Atk/500 number of cards to the grave from their hand or deck. Those cards cannot activate their effects the turn they are sent. So if you’re worried about Shaddolls, Lightsworns, BAs, etc, don’t. They can activate effects next turn, but not yet. Furthermore, Grinning Grave Virus gives a bonus effect if the tributed monster had 2000 to 3000 Atk. All cards your opponent draws are checked for monsters for 3 turns and any monsters are sent to the grave and those monsters can’t activate their effects either. Imagine chaining this to Pot of Desires and tributeing a 3000 Atk Dark monster. Potentially 19 cards will be unavailable to the opponent; 10 Banished, 6 from Grining Grave Virus, Pot of Desires itself, and then the 2 drawn cards if they’re both monsters. 20 cards if you tributed the opponent’s 3000 Atk monster. In one turn from one card. Yeah, this is the Friday Card for a reason. It looks great too. Happy (insert Religious Observance here) Weekend! Score: 5/5 Art: 4.5/5 Shuppets ruining the opponent’s life. We end the week with the newest Virus card in the Lair of Darkness Structure Deck, Grinning Grave Virus. 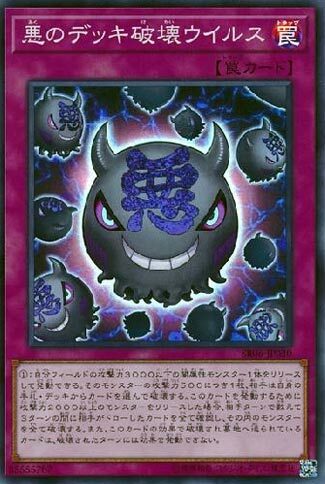 GGV is a Normal Trap that lets you tribute a Dark monster with 3000 or less ATK and make your opponent destroy 1 monster in their hand or deck up to the increments of 500 ATK your Dark monster had on the field, rounding down of course, also if the monster you tributed had 2000 or more ATK, you can look at every card your opponent draws for three turns and destroy all monsters among those drawn cards. Finally, any monster destroyed by this effect cannot use their effects the turn they are destroyed. Honestly this can be a very powerful Virus card that can make your opponent get rid of important monsters of theirs. They are most likely going to destroy monsters in their deck, but if they are important monsters, they will be hindered when they cannot access them. I also like how the monsters destroyed cannot use their effects, so they cannot send something they want to use a GY effect of. The only problem is that this can help your opponent as well as they can destroy cards they want in the GY like Fairy Tail – Snow. This is a great card, but can turn against you if used against the wrong deck. Play it accordingly, probably in the side deck. Art: 4/5 I like the grinning and how evil it makes the virus look, otherwise it would just be your standard Virus art. You didn’t see that coming? Grinning Grave Virus works differently than the others, but can be quite powerful as well. In this instance, you Tribute a Dark Monster with 3000 attack or less, and get to destroy one card per attack x500 of the Monster you select. Your opponent is then forced to destroy one Monster in their Hand and/or Deck. It’s interesting to note from the start that they choose, not you. That makes me a little weary of this card, because dumping things to the Graveyard, from anywhere, can ultimately only end up helping your opponent. But that won’t always be the case. If the Monster you Tribute had 2000 attack or more, you get to look at your opponent’s Draw for 3 turns, and destroy any Monsters drawn. You do get a huge plus that any card destroyed via this effect can’t activate its effect the turn it was destroyed, so even if your opponent sends things they WANT to the Graveyard, it might not do them much good. At least not so quickly. This Virus card, while I still feel is good, seems a bit more stall oriented than the others. But we’ll see what happens.